Fans of the great Finnish composer Jean Sibelius have reason to rejoice this holiday season with the Grammy® Award-winning Atlanta Symphony Orchestra releasing its fourth recording on its record label, ASO Media. Distributed by Naxos of America, this all-Sibelius release features Music Director Robert Spano leading the Orchestra in Symphony No. 6 in D minor, Symphony No. 7 in C Major, and the tone poem Tapiola. The digital release became available for download on iTunes, November 5. The physical compact disc release became available beginning Tuesday, November 19. The ASO Media label is one of the many legacies of Mr. Spano’s 13-year tenure with the Atlanta Symphony Orchestra, and the production team includes long-time Atlanta Symphony Orchestra collaborators Elaine Martone and Michael Bishop. The Atlanta Symphony Orchestra released the first recording on ASO Media in February 2011. The premiere ASO Media recording featured Music Director Robert Spano leading the Orchestra in Jennifer Higdon’s new concerto, On A Wire, featuring eighth blackbird. Ms. Higdon is an Atlanta School of Composers member and Pulitzer Prize-winning composer. Michael Gandolfi’s new choral work, QED: Engaging Richard Feynman, featuring the Atlanta Symphony Orchestra Chorus was also featured. Both works were commissioned by the Atlanta Symphony and given world-premiere performances in June 2010 at Atlanta Symphony Hall. 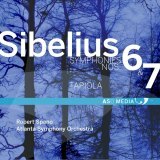 Two additional ASO Media recordings with Mr. Spano and the Orchestra were released in 2011: the June 2011 release features the Atlanta Symphony’s commission of Atlanta School of Composers member Christopher Theofanidis’s Symphony and Peter Lieberson’s Neruda Songs; the October 2011release — an all-Rachmaninov recording — features Garrick Ohlsson playing Piano Concerto No. 3, and also includes Symphonic Dances. The Atlanta Symphony Orchestra and its recordings have won 27 GRAMMY® Awards. Headquartered in Franklin, Tennessee, a suburb of Nashville, Naxos of America is the #1 independent classical music distributor in the U.S. and Canada. Specializing in state-of-the-art distribution, marketing and promotion, Naxos of America distributes nearly 35,000 titles on CD and DVD to traditional brick and mortar retail, as well as offering a comprehensive suite of services tailored to consumer direct fulfillment. Naxos of America is also the largest digital distributor of independent classical music, supplying a catalog of over 30,000 albums to hundreds of digital download and mobile outlets worldwide. Naxos of America offers marketing, e-marketing, publicity, e-publicity, physical and digital e-commerce services, licensing opportunities, streaming services, sales and customer service for all new releases and active catalog titles of Naxos Records and more than 150 distributed labels.